Never do battle without your plucky tabletop companion! 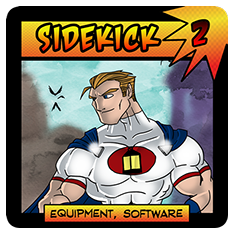 Sentinels Sidekick™ for iOS or Android tracks hit points, stores ongoing effects and so much more! Sentinels Sidekick™ is a helper, not a game. Click Here for Sentinels of the Multiverse: The Video Game. • Play with all Heroes, Villains, and Environments from the base game and expansions: Rook City, Infernal Relics, Shattered Timelines, Vengeance, Wrath of the Cosmos, as well as mini-expansions and promo decks. • Sentinels Sidekick features the beautiful artwork from the card game! Heroes, villains and environments are included. • (iOS Only) Villain difficulty and Hero complexity ratings are built in. Build or randomize the perfect challenge! • (iOS Only) Team up with up to 8 nearby iOS devices to track the same game over Wi-Fi or Bluetooth.